We report a case of aneurysm progression after waffle-cone treatment. A patient in their seventies presented with headaches. Four years earlier, this individual had undergone waffle-cone treatment of a giant ruptured left ophthalmic aneurysm. Angiography demonstrated aneurysm growth. A second stent was deployed through the initially placed stent to recreate the aneurysm neck and to provide support for stent-assisted coiling. The residual aneurysm was coiled with good outcome. Giant intracranial aneurysms carry a risk of rupture exceeding 40% over a 5-year period, depending on size and location.1 In addition, giant aneurysms may cause symptoms secondary to mass effect or intra-aneurysmal thrombosis and subsequent embolic events. Stent-assisted coiling is being tried as a treatment strategy, especially in patients who have multiple comorbidities and are high-risk candidates for surgery.2 The ‘waffle-cone’ technique has been described as one option for scaffolding during stent-assisted coiling, especially in cases of bifurcation aneurysms and in cases with unfavorable anatomy of the parent vessel that precludes traditional stenting.3 In this paper, we present a case of a growing residual giant aneurysm 4 years after initial waffle-cone treatment. An endovascular salvage option is reported. A patient in their seventies was transferred to our institution 2 weeks after developing a left frontal hematoma caused by rupture of a left giant ophthalmic aneurysm measuring 4×4 cm. This individual had made a remarkable recovery except for left eye blindness. The next day, the aneurysm was treated. Under conscious sedation, a 6-French (F) sheath was placed and the patient was heparinized. A 6F Envoy catheter (Codman Neurovascular, Raynham, Massachusetts, USA) was positioned in the distal left internal carotid artery (ICA). A digital subtraction angiogram (DSA) (figure 1A) confirmed the presence of a giant left ophthalmic aneurysm. Microcatheterization of the internal carotid artery distal to the ophthalmic artery aneurysm was difficult because of a ‘tight’ siphon, the wide neck of the aneurysm and a strong inflow jet redirecting the devices into the aneurysm through the neck in preference to the distal parent vessel. Therefore, a 4.5×15 mm Neuroform stent (Boston Scientific, Natick, Massachusetts, USA) was deployed through a RapidTransit catheter (Codman Neurovascular) using the waffle-cone technique (figure 1A). After stent deployment, the catheter was advanced through the stent into the aneurysm and 28 coils (Presidio, Micrus Endovascular, Sunnyvale, California, USA) were deployed (figure 1B). The patient tolerated the procedure well and was discharged in good condition. Lateral digital subtraction angiogram (left internal carotid artery injections) depicting a left ophthalmic giant aneurysm at various stages over the 4-year treatment course. (A) Initial treatment in which a Neuroform stent (Boston Scientific) was directly deployed into the aneurysm neck (the waffle-cone technique is demonstrated with the superimposed cartoon). (B) Subsequent coiling. (C) Recent treatment (4 years later). Notice the jet into the aneurysm. The coil mass is compacted and rides up at the dome of the aneurysm, with some coil strands attached to the distal stent tines of the waffle-cone stent. (D) The final result is acceptable as palliation. Careful follow-up is warranted. Four years later, the patient returned because of headaches. A cranial CT scan and a lumbar puncture were negative for subarachnoid hemorrhage. DSA was significant for progressive aneurysm growth (5×5 cm) and coil compaction (figure 1C). A small, rudimentary left posterior communicating artery and an absent contralateral A1 segment suggested the patient would not tolerate carotid sacrifice. Indeed, the patient became symptomatic immediately during carotid balloon test occlusion but completely recovered with balloon deflation. A thorough discussion of possible options was undertaken with the patient and family, including no treatment, high-flow extracranial–intracranial bypass and conversion of the waffle-cone configuration to a traditional endovascular reconstruction of the aneurysm neck–parent vessel complex through the previous waffle stent with additional coil embolization. An informed decision was made to treat the recurrence with a combination of restenting and coiling. Under conscious sedation and systemic heparinization, a 7F guide catheter (Boston Scientific) was advanced into the left internal carotid artery. Using an SL10 C-shaped microcatheter (Boston Scientific) and a Synchro2 microwire (Boston Scientific), we were able to navigate through the first waffle-cone Neuroform stent, positioning the microcatheter far out in the middle cerebral artery. The Synchro2 wire was exchanged for a Balance Middle Weight wire (Guidant, Temecula, California, USA). The SL10 microcatheter was then exchanged for a Renegade catheter (Boston Scientific), which allowed controlled deployment of a stent (4.5×30 mm Neuroform3) through the waffle-cone stent from the distal parent vessel to the proximal parent vessel (figure 2A,B). At the same session, additional coils were deployed. The final result demonstrated significantly reduced filling of the aneurysm. The patient tolerated the procedure well and was discharged in good condition. Six months later, the patient presented for follow-up, which demonstrated a small residual, which was again coiled (figure 1D). Further follow-up is scheduled in 1 year. Oblique view of angiogram during recent treatment showing the tines of a second stent placed from the internal carotid artery to the M1 segment of the middle cerebral artery. (A) Normal view; (B) close-up view of (A). The natural history of giant aneurysms has been reported to be ominous.1 In patients with advanced age and history of rupture, surgical morbidity of bypass, need for general anesthesia and postsurgical recovery are all important considerations. Endovascular techniques for treatment of giant aneurysms are evolving due to the increase in understanding of flow dynamics and parent vessel-aneurysm biology, advancements in technology and an increase in experience of the operator. Although we achieved excellent obliteration of this aneurysm in the first instance with the endovascular waffle-cone technique, delayed follow-up clearly demonstrated a large recurrence. With increasing understanding of aneurysmal flow dynamics, we are realizing that waffle-cone treatment is not an optimal option, especially mindful of the hemodynamics at play, particularly in patients with a strong inflow jet at the aneurysm neck. The waffle-cone technique probably supports the dangerous hemodynamics that cause growth of these aneurysms and has a high chance of coil compaction at follow-up due to the water-hammer effect. With increasing realization of the concept of diverting flow away from the aneurysm neck to reconstruct the parent vessel and thus achieve aneurysm obliteration, the concept of using the waffle-cone technique is counterintuitive and probably has a high chance of recurrence and failure, as illustrated by our case. In this report, we use a technique of converting a previous waffle-cone configuration into traditional stenting of the parent vessel for neck reconstruction followed by coiling of the remnant aneurysm. We were able to cross the aneurysm neck and access the distal parent vessel during the second intervention. With our growing experience of treating these giant aneurysms, we allow the microguidewire and a microcatheter to follow the natural hemodynamic forces into and around the aneurysmal sac into the distal parent vessel and then exchange the microcatheter for a balloon to be inflated distally to the aneurysm. With the balloon inflated, the microguidewire–balloon microcatheter complex is pulled, allowing for the curve inside the aneurysm to ‘straighten’. In this case, the balloon functions as an anchor. However, in the majority of giant aneurysms after catheterization of the distal vessel is performed, gentle withdrawal of the microguidewire–microcatheter complex with the guidewire in a distal position without the balloon anchor often achieves the same result, as in our second intervention. Although we had converted the previous waffle cone into a traditional stent-assisted coiling, recurrence of the aneurysm at short term could be explained by partial flow direction into the aneurysm neck due to the active limb of the waffle cone. The ability of this new, revised construct to achieve stable aneurysm occlusion needs longer follow-up evaluation. 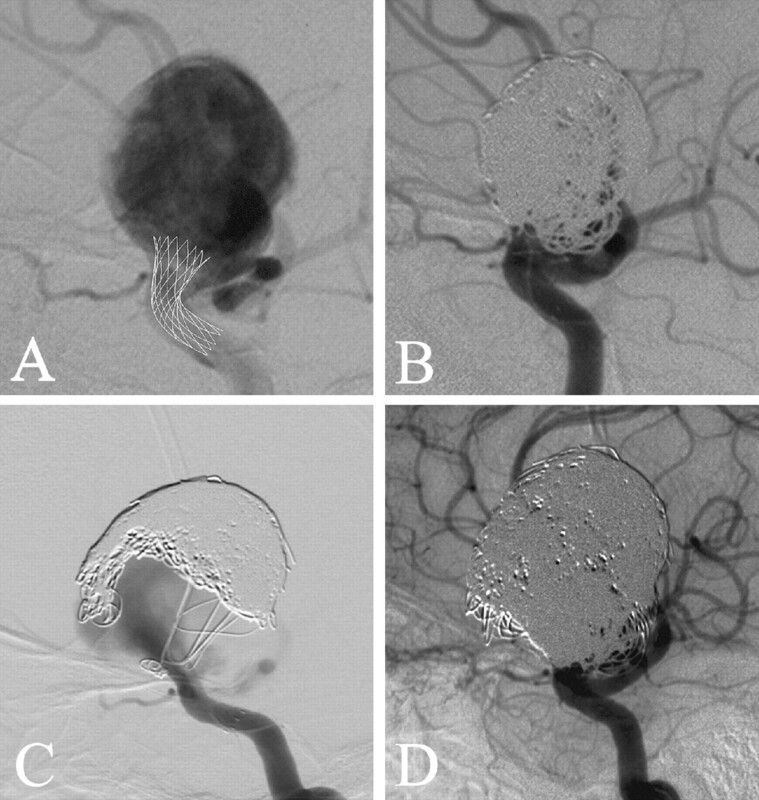 This report demonstrates the feasibility of this new salvage technique, the pitfalls associated with the waffle-cone technique and the increase in understanding of flow-diversion and evolving techniques to treat giant aneurysms. We thank Paul Dressel, BFA, for help with preparation of the illustrations, and Debra J Zimmer, AAS CMA-A, for editorial assistance.
. Unruptured intracranial aneurysms: natural history, clinical outcome, and risks of surgical and endovascular treatment. Lancet 2003;362:103–10.
. Stent/coil treatment of very large and giant unruptured ophthalmic and cavernous aneurysms. Surg Neurol 2009;71:19–24.
. Intra/extra-aneurysmal stent placement for management of complex and wide-necked-bifurcation aneurysms: eight cases using the waffle cone technique. Neurosurgery 2006;58:ONS-258–62. Competing interests Dr Hopkins receives research study grants from Abbott (ACT 1 Choice), Boston Scientific (CABANA), Cordis (SAPPHIRE WW) and ev3 (CREATE) and a research grant from Toshiba (for the Toshiba Stroke Research Center); has an ownership/financial interest in AccessClosure, Boston Scientific, Cordis, Micrus and Valor Medical; serves on the Abbott Vascular Speakers' Bureau; receives royalties from Cordis (for the AngioGuard device) and honoraria from Bard, Boston Scientific, Cordis and from the following for speaking at conferences: Complete Conference Management, Cleveland Clinic and SCAI; serves as a consultant to or on the advisory board for Abbott, AccessClosure, Bard, Boston Scientific, Cordis, Gore, Lumen Biomedical, Micrus and Toshiba; serves as the conference director for Nurcon Conferences/Strategic Medical Seminars LLC. Dr Levy receives research grant support (principal investigator: Stent-Assisted Recanalization in acute Ischemic Stroke, SARIS), other research support (devices), and honoraria from Boston Scientific and research support from Micrus Endovascular and ev3; has ownership interests in Intratech Medical Ltd and Mynx/Access Closure; serves as a consultant on the board of Scientific Advisors to Codman Neurovascular/Cordis Corporation; serves as a consultant per project and/or per hour for Micrus Endovascular, ev3 and TheraSyn Sensors, Inc.; receives fees for carotid stent training from Abbott Vascular and ev3. Dr Levy receives no consulting salary arrangements. All consulting is per project and/or per hour. Dr Natarajan is the recipient of the 2010–2011 Cushing Award of the Congress of Neurological Surgeons. Dr Siddiqui has received research grants from the University at Buffalo and from the National Institutes of Health (NINDS 1R01NS064592-01A1, Hemodynamic induction of pathologic remodeling leading to intracranial aneurysms); is a consultant to Codman Neurovascular/Cordis Corporation, Concentric Medical, ev3 and Micrus Endovascular; serves on speakers' bureaux for Codman Neurovascular/Cordis Corporation and Genentech; has received honoraria from Genentech, Neocure Group LLC, American Association of Neurological Surgeons' courses, and an Emergency Medicine Conference and from Codman Neurovascular/Cordis Corporation for training other neurointerventionists. Dr Siddiqui receives no consulting salary arrangements. All consulting is per project and/or per hour. Dr Hauck has no disclosure information to report. Ethics approval This study was conducted with the approval of the University at Buffalo Institutional Review Board.